Tech Guru is hosting another awesome giveaway till 10th November, 2011, we're giving away a $49.95 WinX HD Video Converter Deluxe as a free gift for our readers. To win this just skip to last section of this post. WinX HD Video Converter Deluxe is all-in-one video authoring software contain HD video converter, YouTube video online downloader, and DVD burner. 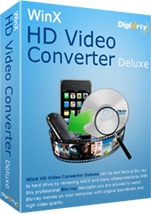 Using WinX HD Video Converter Deluxe you can easily download video from youtube and convert any videos to make it compatible with your portable devices including Android, Blackberry, iPhone/4S, iPad, iPod, PSP, PS3, Xbox, and DVD player. This video converter software enables you to convert between all known audio and video formats, including High Definition video such as MKV, M2TS, MTS, AVCHD, H.264/MPEG-4 AVC, and also regular video such as AVI, FLV, Google TV, MOV, MPEG, MP4, RM, RMVB, WebM, WMV, etc. Moreover, it also features unique technology to support Multi-track HD videos available in AVCHD, BDAV, HDTV, M2TS, MPEG-TS, and MKV formats. It also packed with 160 video codecs and 50 audio codecs, this feature make WinX HD Video Converter Deluxe owns powerful capability to meet all your video conversion requirements without assistance of any 3rd party codec.